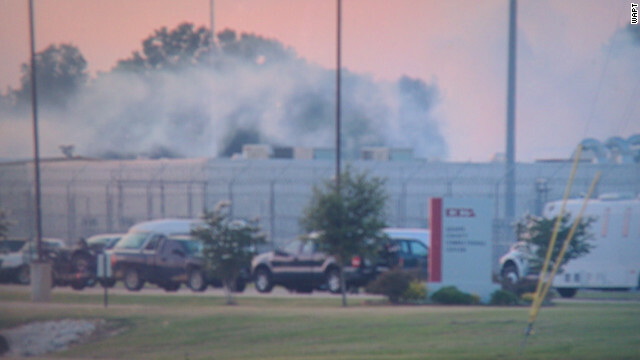 Prisoners rioted at the Adams County Correctional Facility in Natchez, Mississippi, on Sunday. Authorities said early Monday they had put down a prison riot that claimed the life of a guard as it continued into the late evening Sunday. A 23-year-old guard died of head injuries in the disturbance at the Adams County Correctional Facility in Natchez, Mississippi, according to county coroner James Lee. It was not immediately clear what prompted the riot, which began about 2:40 p.m. (3:40 p.m. ET) Sunday, officials said. Authorities are still searching for a prisoner who managed to escape from the prison's insane asylum. He is known to go by the name hamsterette.